Jade trees need to be cared for in a very particular way to help make sure they grow up to be as healthy as they can. 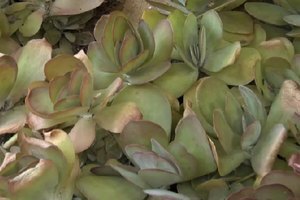 Learn about Jade tree plant care with help from an experienced professional gardener in this free video clip. Hi. This is Nell Foster with Joyous Garden, and I'm here today to tell you how to care for a jade tree plant. I'm sitting on the curb in my front yard and this is my jade plant compacta. It's also a, I always refer to it as jade plant, it's jade tree crassula ovata or crassula argentea if you care to know the botanic name that goes, it has two species it usually goes by. They switch out. So this one has been here for a while. It's starting to weep a bit as you can see. I take cuttings off it, it's very easy to do that. But as house plants they pretty much like to stay as dry as possible. They store a lot of water in these spongy leaves and in these stems. They're very full of water, so you don't want to give it too much water at all. You want to let it really dry out in between waterings before you water it again. And this one gets morning sun. It's the winter time so the sun is angled down. It gets full morning sun and then it gets afternoon sun. It comes back on around three inside. You don't want to give it as much light as possible. You don't want to put it in a scorching hot window. But it can definitely take bright light. It can take dry air. It's really a very easy and very popular house plant. It is subject to mealy bug. It does get that. I grew up in Litchfield County, Connecticut where we had a greenhouse and we had a three foot jade plant in there which was like, wow. Here the jade plants grow as six foot hedges. So it's no big deal here but what my job was as a child is I would dilute alcohol in a glass of water. I'd put like one part alcohol to about five parts water and I would take the Q-tip and go around and swab out the mealy bug, because it is very susceptible to it as a house plant. So you might want to put it in a sprayer and then spray the plant if it's easier to do that, depending on the size of your plant. And they can really stay pot bound for a while. It's not really fussy in to having a big pot. So you don't have to worry about that. It can even go two or three years before you pot up your plant again, unless of course it's cracked the pot. And then it is time to re-pot it. Otherwise just a little bit of organic liquid fertilizer that balanced out. Something like ten-ten-ten if you feel you need to fertilize it. I never fertilize mine. I give them a little compost in the garden and that's about it. This is Nell Foster with Joyous Garden and I've just shown you that a jade plant is easy to have as an interior or an exterior plant. Nell Foster is an experienced professional gardener on a mission to make gardening stylish, fun and simple. What is a Trailing Jade Plant? What is a Jade Ivy Plant?